Ephesus, which is located near the city of Selçuk in Izmir, played an important role in all historical periods due to its geographical location. 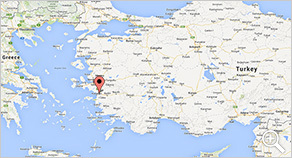 It is situated between Europe and Asia; and located in the central region of the Aegean coast of Anatolia. Ephesus maintained its importance during the Christian period. Under the Eastern Roman Empire, Emperor Constantine I rebuilt much of the city and erected new public baths. Following the Edict of Thessalonica from Emperor Theodosius I. (379-395), the temple was destroyed in 401 AD by a mob, led by St. John Chrysostom. It is noteworthy to mention that the third ecumenical council of the early Christian Church was first held at the Church of Mary in Ephesus in 431. During the reign of Justinian (527-565), Ephesus lived through its third glorious period. In 614, the town was partially destroyed by an earthquake. At this time, the Church of St. John was built by the Byzantine emperor. The city's importance as a commercial center declined as the harbor was slowly silted up by the Cayster River (Küçük Menderes), despite repeated dredging during the city's history. Today, the harbor is 5 kilometers inland. The loss of its harbor caused Ephesus to lose its access to the Aegean Sea, which was important for trade. People started leaving the lowlands of the city for the surrounding hills. The ruins of the temples were used as building blocks for new homes. Marble sculptures were ground to powder to make lime for plaster. Invasions by the Arabs (first in the year 654–655 by Caliph Muawiyah I. of Sassanid, and later in 700-716), hastened the decline further. When the Seljuks conquered Ephesus in 1090, it was a small village. The Byzantines resumed control in 1097 and changed the name of the town to Hagios Theologos. They kept control of the region until 1308. Crusaders, passing through, were surprised that there was only a small village, called Ayasalouk, where they had expected a bustling city with a large seaport. The temple of Artemis was completely forgotten by the local population. During the Anatolian Seljuk period in the 14th century, important architectural works including the Isa Bey Mosque, caravansaries and hamams were built in Ephesus. In the 15th century, the region was incorporated into the Ottoman Empire. After Ephesus had been abandoned and slowly fell into decay, the ruins of the formerly impressive structures served to provide raw materials: they were dismantled, reused and reworked. It is known that the site was frequently the object of descriptions by travelers, primarily of English and France provenance, throughout the following centuries. The actual excavation of Ephesus began in the second half of the 19th century. In 1863, British architect John Turtle Wood, who was sponsored by the British Museum, began to search for the Artemision in Ephesus. At this time, Ephesus and Ayasoluk were dilapidated and practically uninhabited, the fortifications and the Isa Bey Mosque were in ruins. Wood discovered the pavement of the temple in 1869. In 1895, German archaeologist Otto Benndorf, who was financed by a 10,000 guilder donation made by Austrian Karl Mautner Ritter von Markhof, began again excavations. In 1898, Benndorf founded the Austrian Archaeological Institute. After interruption of field work for many years due to lack of financial support and political instability in Europe, intensive excavation activities were carried out again in 1956. Over the following decades, entire urban regions were exposed and the resulting rubble removed. As of today, the Austrian Archaeological Institute plays a leading role in Ephesus. Finds from the site are exhibited notably in the Ephesus Museum in Vienna, the Ephesus Archaeological Museum in Selçuk and in the British Museum. In 2015, Ephesus has been added to UNESCO's World Heritage List. Reference: Ephesos, Architecture, monuments & sculpture. Edited by Friedrich krinzinger. Ertuğ & Kocabıyık, 2007.